Always stuck for what coat to throw over your going out ensemble? Well the Miss Guided Khloe coat will have your back covered every time! 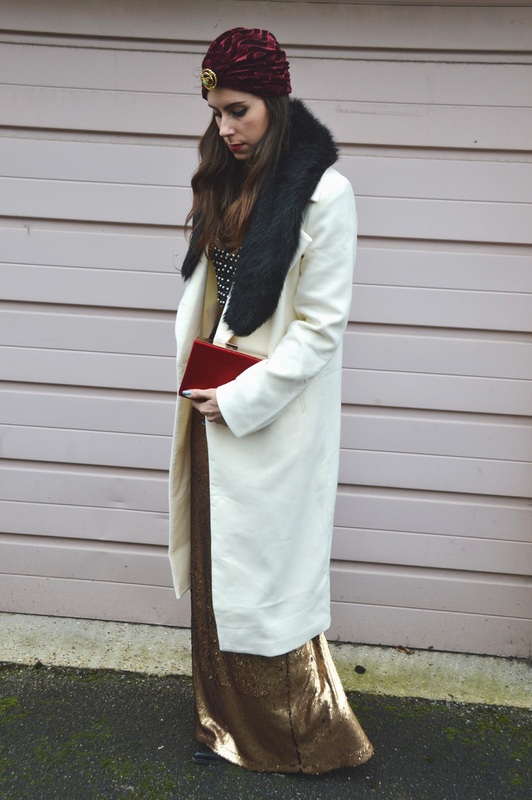 I accessorised this look with my red box clutch from Smashglam which has a faux fur effect and I absolutely love. I have been dying to shoot this turban for ages now from Little Shirley Beans who sells gorgeous unique jewellery and accessories, It's such a nice statement and adds my personal style onto this outfit. It's the perfect ensemble for a fancy dinner or birthday party! Have you been won over by the Khloe coat on TSOP this week? How would you rock yours?! That turban is gorgeous, I love how it's red velvet. The ivory coat and gold sequins are perfect together, such a classy combination. Within this, you'll be able to utilize the net a wonderful method to come across all the tasks you desire. cartier replica uk On-line is the foremost podium to find the top desired destination to discover developer girls outfits, gucci replica sale luggage and also other equipment. In addition, you happen to be in addition presented while using several possibilities one could use and you'll look quickly amid the many solutions. prada replica sale Should you be in addition hunting to get the best on-line girls manner merchants, then you can definitely find a very good merchants that happen to be currently easy to access. chanel replica sale The class leading websites similar to Area Dez are getting to be the favourite desired destination fake chanel wherever girls via all over the entire world occur along with buy a common on-line apparel along with equipment.